For over 60 years, Bud’s Paint & Body Shop has been providing northeast Missouri with quality collision repair.They know that how your vehicle looks is important to you. As collision repair specialists, Bud's understands that placing your vehicle in someone else's hands for repair can be confusing and inconvenient. You'll be glad to know that at Bud’s Paint & Body Shop they take the time to fully answer ALL your questions. They'll go over the damage to your vehicle, the necessary repair procedures and the amount of time needed to complete the job. Their people, state of the art equipment and facilities demonstrate their commitment to provide you with the best possible care, service and quality. A precision repair starts with a craftsman-like attitude. Bud’s Paint & Body Shop takes pride in paying close attention to the small things - from ensuring the safety and integrity of your vehicle to on-time job completion. Their personnel are highly trained and receive regular training to keep up with the latest technical innovations. They've invested in the latest computerized equipment and advanced material systems that are specially designed to restore your vehicle to its original condition. Bud's Paint & Body Shop gets your car returned to you more quickly and with a higher quality repair that's backed by their customer proven warranty. At Bud's Paint & Body Shop, they pride themselves in doing the best job possible - the first time. When you enter Bud's Paint & Body Shop you can expect the highest standards of repair while always being treated in a courteous and professional manner. Bud’s Paint & Body Shop - we’ll meet by accident at 105 Thompson in Palmyra. 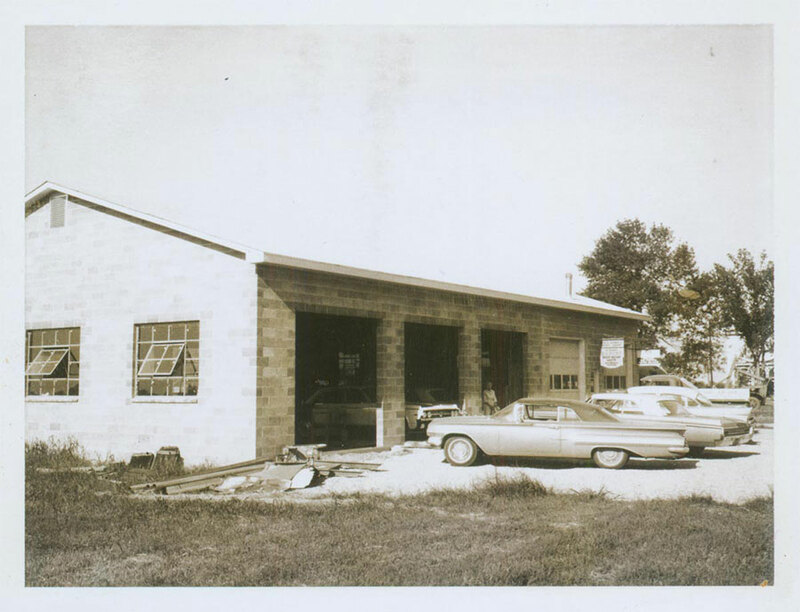 Founded in 1945 by Bud Englehardt, Bud's Paint & Body Shop has been loyally serving northeast Missouri for over sixty years. Today Bud's Paint & Body Shop is run by Larry, Bud's son and Chad, Bud's grandson. Together, they have dedicated their lives to understanding the business and making it better serve their clients. The new shop is a perfect example of growth for faster customer service. One of the great things about Bud's Paint & Body Shop is the long term employees. The staff at Bud's really understand and take pride in their work. Lots of shops have high turn over, but not Bud's. This employee stability means more experience, knowledge and capability for you the customer. Next time you're by, take a look at the mural made up of historic photos of the shop in early days.